Well there's people... and more people. What do they know know know? And vacation down in the Gulf of Mexico. My wife has been trying to get the garage cleaned out for a sale she's having on Friday and Saturday. Today, she requested that I sift through some of the boxes I brought back to our house just before the end of last year. I pared back quite a bit, but looking through old newspaper clippings and photographs brought back memories. I'm not sure where the train photos fall on the readership boredom scale. Maybe not the most interesting thing, but perhaps more exciting than my digressions on Schnarch's writings. I dunno. I do know that there are a lot of 80s music fans out in this corner of the Blogosphere, so maybe throwing in some music video references will make this post more tolerable. Today I'd like to reveal a little bit about my past. I grew up in The Small Town. 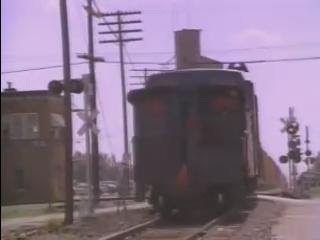 If you watched John Mellencamp music videos from the early 80s, chances are you saw many of the scenes of The Small Town. 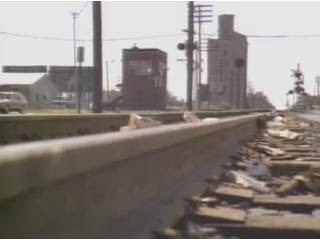 His video for "Pink Houses" always had a soft spot in my heart because it included vignettes of railroad activity there. A couple years ago, I figured out how to use a command line program on Linux to slurp videos from a Real Video server, and I captured "Pink Houses" on my computer for all time. 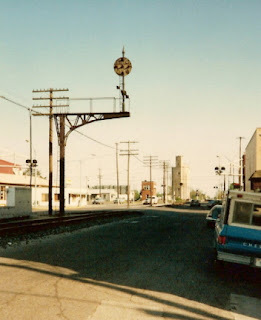 Just shy of the grade crossing is a signal used to regulate the movement of trains on the line. The signal is called a position light, gaining its name from the fact that it uses the alignment of lamps to emulate the positions of the semaphore signals that they replaced. This purpose of this signal is to serve as an early warning to the oncoming train. A little over two miles north of here, there is a crossing with an east-west rail line. The crossing is protected by a similar signal. The unseen crossing... drawing near, yet still unseeable. It represents the choice I will need to make with respect to my family and my career. The east-west direction of the other line represents opportunity, something that is commonly associated with the westward direction in American culture. On a more literal level, some of the more radical choices I could make involve moving far westward. I failed to mention that the intersection in question was featured in "Pink Houses". I pulled some screen captures to give you an idea. The scene in this first still takes place just after the second verse has completed. It is a ground level view of the rail line intersection. The tower that controls the signals can be seen in the left background. The large structures in the background are the bins of a long defunct grain mill. That large black object just in front of the bins is the position light for which the other signal in my earlier post served as an earlier warning. The intersection makes another appearance at the very end, as a southbound train makes its way across the diamond, the special piece of track that allows two rail lines to cross. 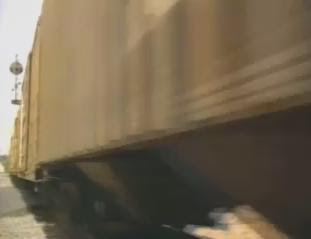 Does anyone remember when through freights still had cabooses? The next photo comes from my own collection. It was taken at about the same time period as the filming of "Pink Houses". You can see the intersection way in the background. The signal that guarded access from the north was a graceful cantilever structure, and it can be seen in the foreground. You can get a larger version of image by clicking on the graphic. The cantilever still stands today, but the position light signal it hosted has been removed, so it is now more of an undignified, decapitated corpse rather than a stately, ever sentient guardian. The cantilever signal makes a cameo appearance just before the beginning of the third verse, albeit from the other side. 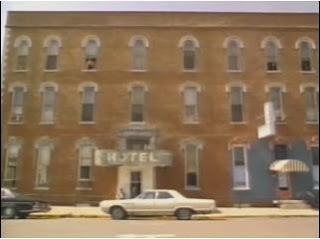 My photo just happens to have been shot from the vantage point of the Lynn Hotel, which is also featured in the video. During the interlude between the second and third verses, you get a full view of the building. 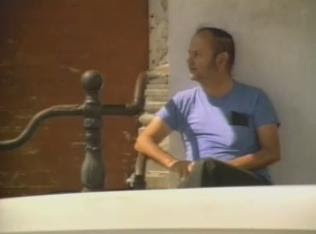 At the time the video was shot, the hotel itself had been closed down. Long after the hotel's closure, a cafe and lounge continued to operate in the building. The lounge entrance can bee seen on the lower right. The cafe was accessible from the south side of the building (unseen, off to the left). In the evenings, older guys would congregate with lawn chairs just below the old HOTEL marquee in this photograph to talk. The video captures this, too. However, it was earlier in the day, and there was only one guy sitting there. The building was razed sometime in the late 80s, if I recall correctly. My hometown has a horrible habit of letting old buildings decay to the point of irreparability, and then tearing them down for parking lots. If they keep it up, the Small Town will be all parking lot sometime around 2047. Ain't that America for you and me?